A plant of wide-spread value, Moringa extract is a rich source of plant protein (including all necessary amino acids), fibre and antioxidants. A super-power of a plant, Moringa - also commonly called drumstick tree, horseradish tree & ben oil tree - grows in the Southern foothills of the Western Ghats and in parts of Asia. The name of the genus Moringa is derived from the word murungai - the Tamil word for ‘twisted pod’. The versatility and effectiveness of Moringa extract was first discovered on the Indian subcontinent around 2000 BCE. Moringa extract was used for a wide range of conditions, from blemishes to asthma even to tuberculosis and heart disease. Moringa was also used as a natural sunscreen on the harsh deserts of Egypt; and as both ointment and perfume in Greece & Rome. Growing best in dry regions, the Moringa tree thrives off the sun and heat, and can be grown using simply rainwater. The incredibly vast range of benefits of the Moringa plant makes it a favourite for health stores and practitioners. Its versatility is illustrated in how various parts of Moringa extract are edible - the immature seed pods, leaves, mature seeds, oil, flowers & roots. Moringa extract and leaves are a great source of essential nutrients like manganese, protein, Vitamin K, B Vitamins and Vitamin C. The drumsticks add dietary fiber, potassium and magnesium to the body. Moringa dosage kills free radicals in the body with its mix of antioxidants like chlorogenic acid, kaempferol, zeatin, rutin and caffeoylquinic acid. Treating blood sugar levels, maintaining optimal levels of cholesterol, protecting the liver and helping in skin and hair-care as well - Moringa is truly a miracle plant. Further healthy features of Moringa extract are that it offers a lot of relief from uncomfortable stomach ailments, allergies and edema. Moringa extract is also full of phytonutrients and antioxidants. These properties of Moringa extract assist in the lowering of levels of blood sugar. Moringa extract also significantly reduces inflammation and levels of cholesterol in the body. Along with these benefits, Moringa dosage also has proven to be a great help in preventing and altering conditions like asthma, anemia, and cancer. Not only that, Moringa extract can also build you a strong immune system and help to combat undernutrition. 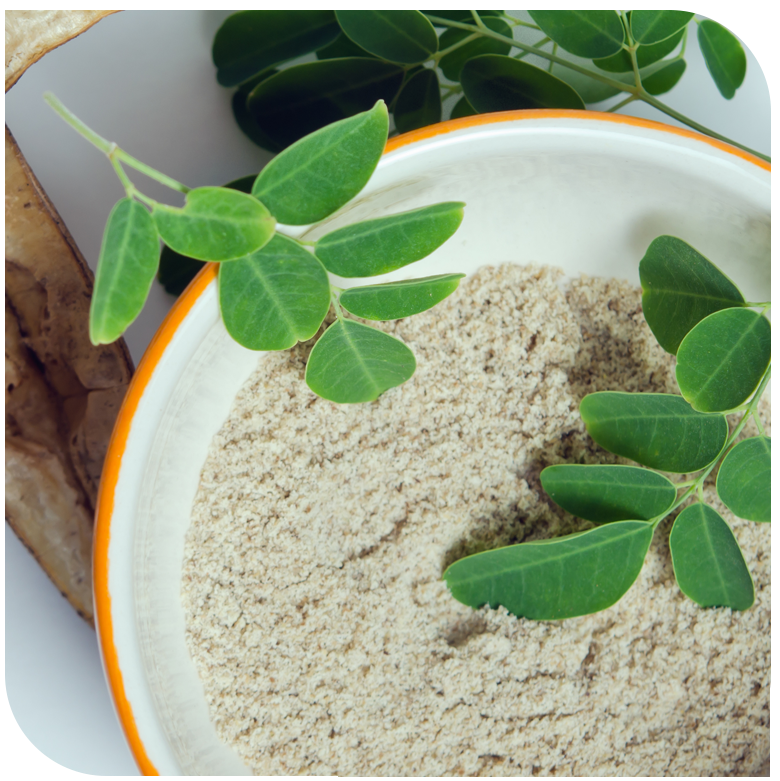 The mineral wealth of Moringa extract is abundant with calcium, iron, magnesium, potassium and zinc. Moringa extract is often referred to a mother’s best friend with reference to its galactagogic properties. The powerful antioxidants in Moringa extract cures damage caused by stress. Isothiocyanates present in Moringa extract are very important in treating abdominal disorders like gastritis, ulcers and constipation. The incredibly vast range of benefits of the Moringa plant makes it a favourite for health stores and practitioners. Its versatility is illustrated in how various parts of the tree are edible - the immature seed pods, leaves, mature seeds, oil, flowers & roots. Moringa extract and leaves are a great source of essential nutrients like manganese, protein, Vitamin K, B Vitamins and Vitamin C. The drumsticks add dietary fiber, potassium and magnesium to the body. Moringa extract kills free radicals in the body with its mix of antioxidants like chlorogenic acid, kaempferol, zeatin, rutin and caffeoylquinic acid. Treating blood sugar levels, maintaining optimal levels of cholesterol, protecting the liver and helping in skin and hair-care as well - Moringa is truly a miracle plant. Further healthy features of Moringa extract are that it offers a lot of relief from uncomfortable stomach ailments, allergies and edema. Moringa extract is also full of phytonutrients and antioxidants. These properties of Moringa extract assist in the lowering of levels of blood sugar. Moringa extract also significantly reduces inflammation and levels of cholesterol in the body. Along with these benefits, Moringa extract also has proven to be a great help in preventing and altering conditions like asthma, anemia, and cancer. Not only that, Moringa extract can also build you a strong immune system and help to combat undernutrition.